Plans for the transformation of this former industrial site were first put on display in September 2013... and received a positive reaction - you can read our review of them here. It's great to see the first phase of houses now coming out of the ground, built by Wilmott Dixon builders. We were really pleased (and pleasantly surprised) to get a call from Jayne Stocks, Wilmott Dixon's Community Liaison Manager inviting us down to find out more. Jayne is responsible for making links to local community groups and organisations, and had seen the 'Our Sneinton' newsletter which prompted her to get in touch. We met with Jayne and her colleague Shaun Moses, the Senior Build Manager on the project in the Victorian "Trent Lane Villa", one of the very few existing houses in the area, which is currently being used as the site office and information centre. 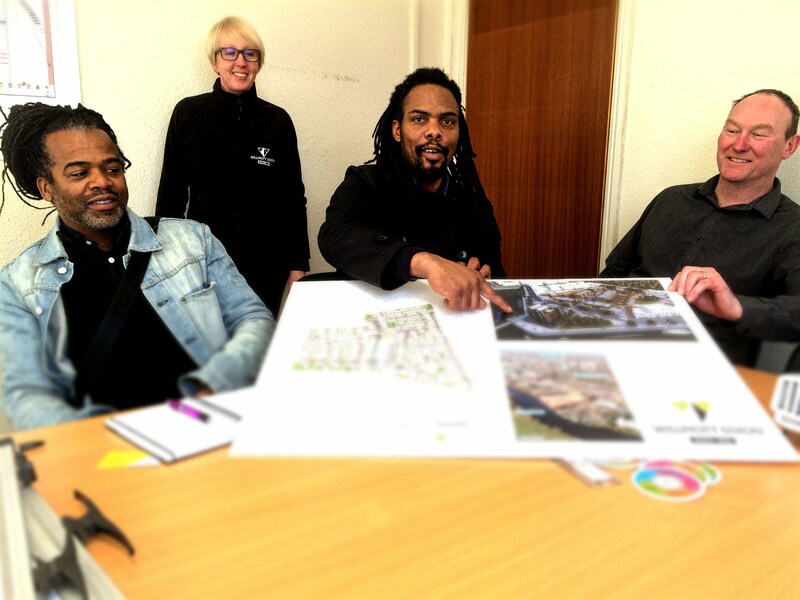 We discussed the development and how it could open up the riverside to the public in the future, and how Sneinton Alchemy and the Our Sneinton project might help build a sense of community for the first pioneering residents. Below: The site masterplan, which will be built in several phases over the next few years (plan from 2013 consultation).